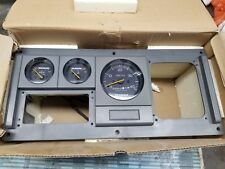 Nos yanmar gauge clusters. Gauges removable for any application. Swivel Drink Holder Set Boat, Marine, RV BY ZURN Self Leveling, USA 1972 NOS? Teleflex I/O & Inboard. Tachometer 6000 RPM NOS. New old stock. Posted a lot of pictures to show condition. Original box. Some specs on the lens may come off with solvent. . . Grey and black bezel. For sale boat bow light new old stock chrome plated brass with gasket for mounting . The base is 2 3/8” wide . Picked up at antique boat show 5 years ago . Kawasaki Yamaha Lanyard Vest Clip. Nos . Shipped with USPS First Class Package. This 4” cleat is from the early 1990’s and probably ABI but the sticker is gone. The base is 1 3/4” wide, and it takes #8 screws spaced 1 1/8” X 1” across. If you zoom in you can see that the inside of the base is not well finished. Feel free to contact me with any questions you may have. 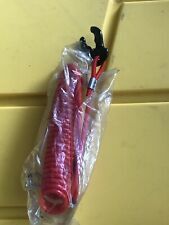 Teleflex SS14108 Rack Steering System 8 Ft. NOS . Outer Wear Flame Arrestor Cover! NOS. Outer Wear Flame Arrestor Cover! NOS. . Shipped with USPS First Class Package. #991227 driver. Box is worn, but part is not used. New Old Dealer Stock In Box. New old stock Mercury elbow Part: 52637 B4 We have thousands of new old stock parts in many different makes and models. No warranty expressed or implied. Item is sold in as is condition. Please be sure that this is the correct item, as we do not accept returns. Buyer pays shipping and handling change, unless otherwise noted. You can call us at 908-237-5268 with any questions. New old stock power trim tilt wiring harness Part: 174214 We have thousands of new old stock parts in many different makes and models. No warranty expressed or implied. Item is sold in as is condition. Please be sure that this is the correct item, as we do not accept returns. Buyer pays shipping and handling change, unless otherwise noted. Like new used as test prop. Fits most OMC Cobra v6 and v 8 also most v6 Evinrude and Johnson 15 spline thrust washer needed may vary. Mercury Cranksft Bearing NOS 30-803893T Sportjet / Force Aftermarket Part TS-010-2016-01 Retail value of Mercury Part $75.00 May fit many other years models. Still in sealed bag. Auction is for an aftermarket crankshaft bearing TS-010-2016-01 sold by TSM Performance that was part of a complete rebuild kit that I did not need. As with any part, it is your responsibility to verify if it will work in your application. Suggest online searches or your local dealer. Study photos closely for condition. Please ask any questions before bidding all sales final. Please see my 100% seller feedback no disappointments here. No international shipping. Thank you for looking and good luck! Vintage Brass Top Mount Oarlock Socket NOS PB 6. This is for 5/8 shank. New Old Dealer Stock In Open Box. NOS fuel pump part number 13H6306. This could be a marine application. Oarlock 1/2 Inch Shaft NOS PB 6. This is a galvanized oarlock with a 1/2 inch shaft. The shaft measures 1 1/2 inches long. New old dealer stock with box from closed up Johnson marine business. We took out of box washed it off and took pictures. Nearly flawless. NOS Struts for Chris Craft 315 or 316. Includes both port and starboard struts with cutlass bearings installed. This package is very heavy (80 lbs) so I’m including the cost of shipping (Conus only) in the buy it now price. WSM YAMAHA DRIVE DAMPER 003-206 NOS . Shipped with USPS First Class Package. Oarlock 1/2 Inch Shaft NOS PB 6. This is a galvanized oarlock with a 1/2 inch shaft. The shaft measures 2 3/4 inches long. New Old Dealer Stock In Box. You will recieve everything you see in the picture. New Old Dealer Stock In Package. MP9323 NOS BOAT WINDSHIELD *PAIR* REAR 22" X DEEP 14" X HIGH 13"
NOTES: ONE OR TWO SMALL SCRATCHES. Mike: 630-918-823four. Steve: 228-365-023zero. Yamaha Sterndrive Parts L4 3.0 ENGINE EST 1993 DISTRIBUTOR & COMPONENT PARTS. All parts are in good usable condition unless otherwise noted. Fuel line is 1/4" ID and 9/16" OD. Part may fit other models. Part Number: 16-315-0146, 0418-8053. Quicksilver/Mercury Switch Assembly # 58124A1 NOS Free Priority Shipping! Part # 58124A1. No Longer Available. 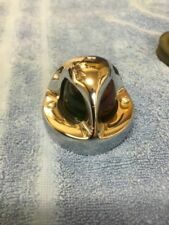 NOS BRONZE THRU HULL WITH REMOVABLE PLUG. Plug looks to be Delrin/ Nylon? w/ 2x O rings. WELL BUILT!! This is a a brand new, heavy and well built boat table post cover. It measures 5” Diam X 4.75” Diameter and was professionally made. I am sorry but I don’t know the manufacturer. Hart to find. Probably from a Malibu back in the 1990’s. Thanks for looking.